About : “State of the Union” is a thirty-two page pamphlet published by Printed Matter and a separate thirty-one print installation. Both projects focus on the U.S. states that have amended their constitution through defense of marriage act ballot mesures to explicitly define marriage as between a man and a woman. Each page (or print) is dedicated to one of these states and includes the state ballot title, text of the ballot measure and the official voter results in numeric count and percentage. 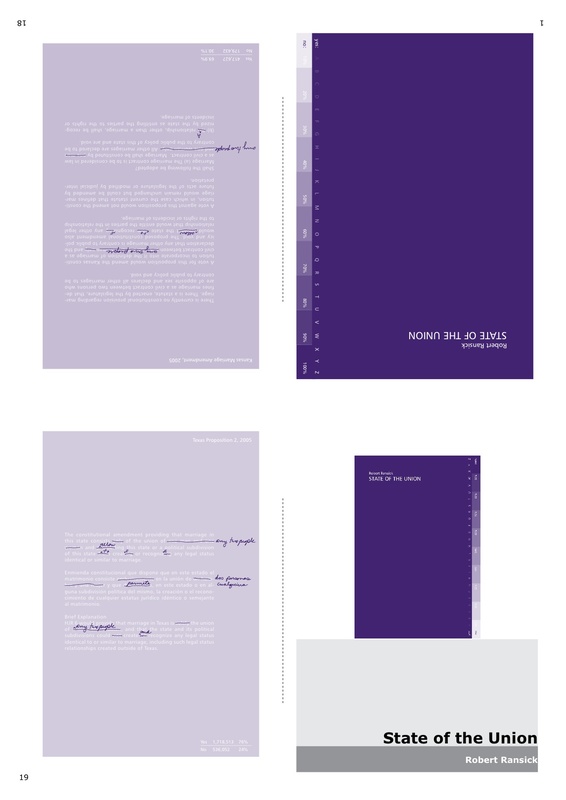 All text is printed in white Humanist font on a solid lavender background. The opacity of both the printed text and the lavender background are controlled by the numbers of “yes” and “no” votes received. The shade of the lavender background is tied directly to the “no” votes in the state. The higher the percentage of “no” votes, the more opaque (saturated) the lavender becomes. For example, if thirty-five percent of the vote was against the measure, the lavender is thirty-five percent opaque. Likewise, the opacity of the ballot text is linked to the “yes” vote and becomes more prominent with the higher “yes” percentage. Lavender was chosen as the dominant color because of its historical association with the gay, lesbian, bisexual and transgendered rights and liberation movement. Every ballot measure has been copy edited by the artist to reverse the negative connotations and render marriage between any two people legal. “State of the Union” is a poetic call to action and a necessary record of this shifting and contentious moment in history. Robert Ransick is an artist who works in a wide range of media and has exhibited in New York City at such venues as Eyebeam Center for Art and Technology, Exit Art, Storefront for Art and Architecture, the Howard Greenberg Gallery and White Box Gallery. In addition he has shown at The Museum of Contemporary Photography in Chicago, Illinois and at the Palazzo delle Esposizione in Rome, Italy, among others. He has received funding from Franklin Furnace and the Mellon Foundation and has been an artist in residence at Eyebeam Center for Art and technology. He has worked as a curator and cultural producer in collaboration with Creative Time, the Aperture Foundation, and Blindspot. He is a co-creator of the Blur conferences and other events focused on current creative practices in digital art and culture. Previously, he was the Director of the Photography Department and the Director of the Computer Instruction Center at The New School. He has taught at The School of Visual Arts, Parsons School of Design, and The New School for Social Research. BFA, Photography With Honors, The School of Visual Arts; MA, Media Studies, The New School for Social Research. He is currently a full-time faculty member in digital arts at Bennington College. Robert Ransick lives and works in New York City, but spends a good deal of time in Southern Arizona.